Papaya leaf can heal from your dinner table. Indonesian culture boasts a beautiful dish of sautéed papaya leaves. Saute ground spices until fragrant , red chili entries . 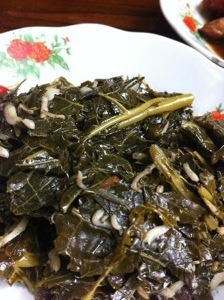 After wilting , enter petai , anchovy , and the last was boiled papaya leaves stir . do not forget to add enough water and cook until done ( until the water is reduced ) . Longer than a really good diet, research on papaya leaf tea indicates that it may take three months of diligent use for the tea to have effect against cancer(s). So Woah! That feels like a show-stopper! The real challenge for our team of natural healing (Functional Foods) enthusiasts is to convince people to really commit while they may still feel unsure, unconvinced, and encouraged daily to rely on more traditional methods…ie, the most recent FDA-approved solution for their specific line of cancer. Our team for papaya leaf tea does not discourage traditional methods, we can only ask that you try to implement our tea alongside whatever other plan you are on. Back to the “three months to go” challenge. First, after six years of research we are confident that this tea can heal. We need a way to pass that confidence to you so that you can get on with the three months! Our team does not want to interrupt your current doctor-recommended plan, we want to ADD to it! For those who read this and know someone with cancer, if you cannot convince them, will you take it for the health of your own body? Will you take the Three Months To Go Test? 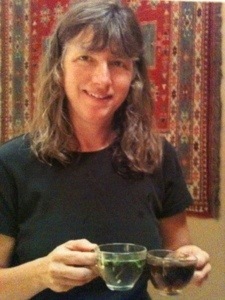 Maybe for you it will reduce your inflammation, help your body clean up, create more good cells, help you heal faster! And, of course, keep possible cancers at bay. Then buy the book! The science related to the enzyme papain should be enough to convince! Just try the tea and give it Three Months, or give it to someone you love who should! The Julia Ruffin Project grows and researches papaya leaves for use as a medicinal tea. There is a noted difference in the amount of alkaloids in a young papaya leaf. There is also a big difference in taste. The young leaf tea is not bitter, and has smoky hints with a distinct smell of fresh and tantalizing unique to the herb. 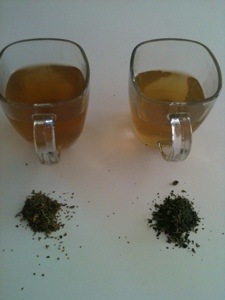 In the photo, brewed young leaf tea is to the right, a hint of bright yellow, and next to the signature bright green dried and cut leaves. Then I learned. Call this silly, but then there was a functional problem. I don’t care for hot (or cold) tea. One would think that it is worth it to drink a tea that has effect against cancer. I hesitate. My solution was to put it in my coffee everyday. I literally just add the tea leaves to the coffee grounds. The taste difference is so slight for what miracles the tea works in my body! I still have trouble accepting that papaya leaf tea has effect against cancer, even though I have studied this for six years. I think that I was waiting on a pill.